Figure 1. Use a non-contact voltage tester for your first test. OSHA and the NFPA 70E Standard for Electrical Safety in the Workplace both direct workers to deenergize all energized parts to which an employee may be exposed, unless energized conditions are required for troubleshooting. Proper planning and preparation will make any type of testing simpler and safer. Perform a risk assessment. A risk assessment is required by NFPA 70E Section 110.1(G) Electrical Safety Program, 130.3 Working While Exposed to Electrical Hazards, 130.4(A) Shock Risk Assessment and 130.5 Arc Flash Risk Assessment. NFPA 70E does not use the phrase "hazard/risk analysis" anymore. The definition of risk assessment in Article 100 incorporates determining the hazards. Having to stop work to fetch other tools or test instruments interrupts focus and can contribute to an accident. Traffic in the area can pose a substantial hazard. This includes foot traffic, as well as forklifts and other type of vehicles. Barriers, barricades, signs and possibly an attendant may be needed to prevent intrusion into the work zone. Complete an Energized Electrical Work Permit (EEWP). This is required by NFPA 70E Section 130.2(B) Energized Electrical Work Permit. The EEWP incorporates the risk assessments needed, details the required PPE, as well as the precautions needed to protect the work zone. It also contains an authorization to perform energized work, which is critical to worker safety. Management must approve all energized work prior to the task, as they are responsible if an incident should occur. NFPA 70E has expanded the exemptions for the use of an EEWP in Section 130.1(B)(3), but those exemptions only relieve the worker of having the EEWP signed off by management. All other requirements of Article 130 still apply. Informative Annex J contains an example EEWP. Since it is located in the annex it can be modified as needed to suit a specific task or job condition. Is this troubleshooting or testing for the absence of voltage? What test instruments are required to verify the energized or de-energized state? Is a safety backup required? 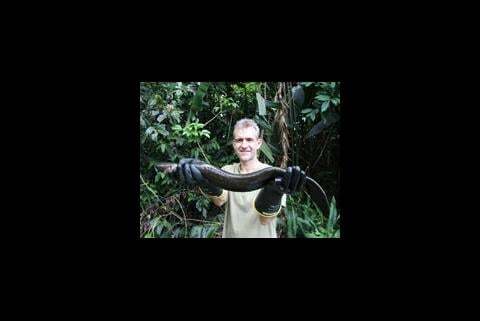 Has he/she been trained in the proper methods of release, how to contact emergency assistance or CPR/use of an AED? Where is the location of the nearest AED? Where will the safe work zone be established? Will it be at the limited approach boundary or the arc flash boundary? What Personal Protective Equipment (PPE) will be required? What is the voltage of the circuit? 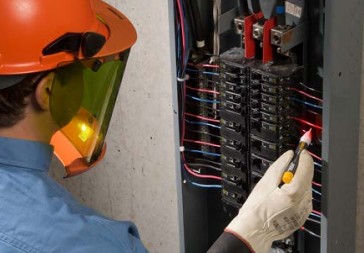 What is the arc flash boundary? How much incident energy is possible at your working distance? What method is being used to determine the arc-rated clothing and PPE required? Has an incident energy analysis been performed, with labels on the equipment or is the Table Method being used? Is the test instrument functioning properly? Most importantly, can this task be performed safely? Line (7), Part II of the sample EEWP in Informative Annex J states "Do you agree the above-described work can be done safely?" Honestly, if you have the heebee-jeebees about performing a task while the equipment is energized it just needs to be shut down. If testing for the absence of voltage, that is, to verify there is no voltage present before beginning work, consider using a noncontact proximity tester (Figure 1), an electrical tester (Figure 2), or a multimeter (Figure 3). Figure 2. For your second test, pick a digital, not solenoid, electrical tester. Proximity voltage detectors are good for an initial test, but should always be followed up with a direct-contact meter. NFPA 70E requires that the conductors or circuit parts be tested phase-tophase and phase-to-ground. Proximity voltage detectors only test phase-to-ground. Note that this does not apply to medium and high-voltage systems, as proximity voltage detectors are the preferred method of testing. At Shermco Industries, we issue each of our technicians a proximity tester like the one shown in Figure 1 to keep in their top pocket or somewhere it can be easily seen. During disaster recovery projects, especially where there has been widescale flooding, these proximity voltage detectors provide a critical early warning of energized conductors or circuit parts that may be hidden or presumed deenergized. We believe they have prevented many shock incidents by using them in this manner. If the proximity voltage detector lights up, there is definitely a voltage somewhere; it just may not be where it's expected. The insulated test point touches grounded metal. The cable being tested is partially buried. The user is isolated from ground. It is used inside a metal enclosure. Proximity testers also won't detect the presence of voltage through the shield on shielded cable. To better understand why proximity testers have these limitations, read the Fluke application note on the subject, "Understanding capacitive voltage sensors." The key word is "proximity." Proximity varies not just by distance, but also by the strength of the expanding and contracting magnetic field around an energized conductor. "Distance" has to account for everything between the tester and the electrical source, including the air, insulation, breaker material, twist locks, and so forth. The real issue is that proximity testers may indicate voltage, or they may not, depending on specific circumstances. For absence of voltage testing, a different, completely reliable test method is required. Back in the day, solenoid testers were the weapon of choice, mostly because everything else was so expensive. There are some issues with using these. Figure 3. A DMM with a low-impedance option is the smartest pick for a live-dead-live test. If the voltage drops below about 70 to 90 volts, depending on the specific tester used, the tester doesn't indicate voltage is present. I've been nailed more than once because of this. Once I was testing a motor controller that had a blown fuse. That phase was being back-fed through a control power transformer (CPT) and should have shown voltage. Due to the impedance of the CPT and the tester, I received no indication. I screamed like a chicken when I made contact. Even solenoid units with indicator lights stop lighting up at about 30 volts or so. This won't send a person into fibrillation, but it could cause them to back into something that could. Solenoid testers wear out and the voltage scale becomes scarred up. If you can't read the voltage indicator and the solenoid is so weak that it barely vibrates, it's not reliable to use. 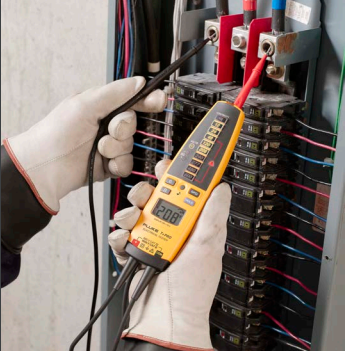 Fluke strongly recommends using the newer generation of fused, electronic testers. They still vibrate and light up, but they're much more accurate, they measure down to 10 volts and they're fused for transient protection and are CAT-rated. Multimeters are the best standard test instrument for making accurate contact measurements to determine if a circuit is energized. 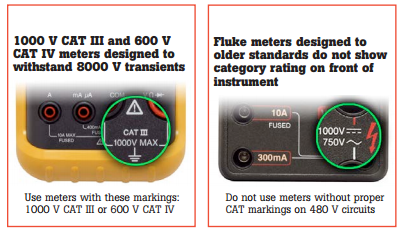 Care is needed when using multimeters. Turning the multimeter function dial to the wrong function (amps instead of volts, for example) is one of the most common mistakes people make when using a multimeter. Also, older models that are not auto-ranging could be put into a range that is too high, making the voltage appear much smaller than it really is. Someone in a hurry, stressed or not careful could get in trouble. Using newer meters resolves this issue, as well as bringing new features and protections in. The Fluke model 117 for example, has a low input-impedance function for voltage testing that can be a great safety feature when determining if a "ghost" voltage is casued by a backfeed or is induced. The Fluke 117 also has a built-in noncontact voltage test function, for people who want to start with a proximity test and then move to a contact test, with the same instrument. 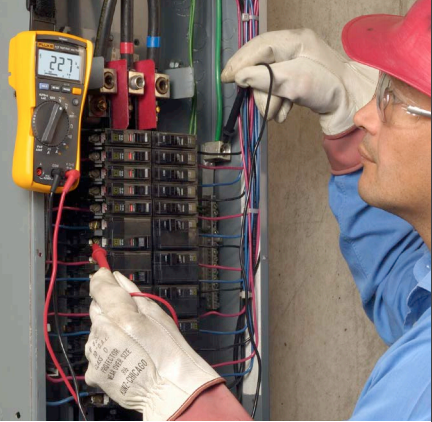 Any direct-contact meter can be dangerous if connected to a circuit voltage that is higher than it is rated for. 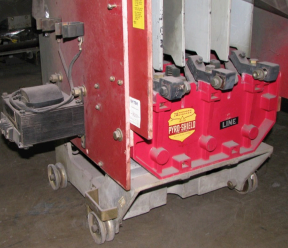 In my travels around the country, several facilities have had fatalities due to an electrical worker troubleshooting a 2.3 kV or 4.16 kV motor starter control circuit. The CPT is often mounted on the side of the drawout unit and the terminals cannot be seen clearly, Figure 4. The technician is trying to test the 480 V circuit and comes into contact with the medium-voltage circuit instead. Bad things happen when this occurs. 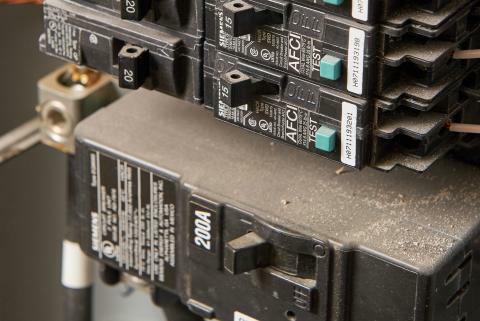 OSHA states that test equipment, and their accessories, shall be rated for the circuits they'll be connected to. NFPA 70E "(2) Rating. Test instruments, equipment, and their accessories shall be rated for circuits and equipment where they are utilized". Does it sound strange to require PPE for a deenergized test? Until electrical circuits or parts are tested and found absent of voltage, they must be considered energized. Before working for Shermco, I was the Electrical Field Services Manager and Compliance Manager for SUNOHIO. Early one morning, I took a crew out to test a power transformer that was having problems at an industrial customer's facility. Upon arrival, I asked for a one-line to write the LOTO procedure. The drawing I was given was so old it was yellowed. I was assured by both the plant manager and the electrical supervisor that the one-line was fine and no changes had ever been made to the 4.16 kV system. My crew proceeded to lock and tag the system and, since it was a double-ended substation, it was fairly easy to isolate the problem transformer. The terminal chamber cover was removed and, being completely certain the circuit was deenergized, I was about to untape the connections in preparation for testing. At the last moment, I decided to follow good safety practice and test the circuit, even though I knew "it was dead". The proximity voltage detector lit up and I almost fainted. Another lesson learned. An alternate circuit had been installed at some time in the past and no one working there was aware (or remembered) it. Take my word for it, it's not dead until it is proven dead. Don't make my mistake. There was nothing funny about this incident. Electrical workers are required by OSHA to place equipment in an electrically-safe work condition (although they don't use those words) in 1910.333(b) and the NFPA 70E in Article 120, which involves Lockout, Tagout, test operating, testing at the point of contact, and grounding, if necessary. Grounding may or may not be practical on low-voltage systems, but should be done whenever possible. Capacitors, UPS systems and long cable runs can maintain a stored charge. The application of temporary protective grounds eliminates this hazard by discharging the stored energy. There may also be induced voltages if the conductors are from a long cable tray containing other, unshielded conductors that are still energized. The expanding/contracting magnetic field around the energized cables can induce a voltage into the deenergized cable. Be certain to have a tight, clean connection at the point of grounding— otherwise the grounds could blow off under short circuit conditions. Before beginning the absence of voltage test, inspect the test instrument to ensure it is working properly. Does the display function properly? Are the digits broken or do they fade in and out? This could indicate a low battery, damaged dosplay or loose connections to the display. Are there any signs of damage, such as cuts or breaks in the insulation, melted or discoloration of the insulation, or crushing of the test lead. Crushing could indicate internal damage that may not be obvious externally. Are the probe ends straight and undamaged. Burnt or bent probe ends could prevent the test instrument from indicating properly. Are the probe ends tight? Loose ends could interfere with measurements. Test for continuity by setting the test instrument to the OHM function (Ω) and touch the leads together. Any reading above 0.3 ohms indicates an issue. If the test leads are fused, verify the fuse is still good. Be certain the test instrument is on the voltage function before proceeding. Wearing proper PPE, measure a voltage similar to the voltage of the equipment about to be tested. NFPA 70E Section 120.1(5) states "Before and after each test, determine that the test instrument is operating satisfactorily through verification on a known voltage source." Note that a known voltage source is required to verify the test instrument. This could be any known voltage source, but should be the same voltage magnitude and type (AC or DC) as is being tested. Never wrap test leads around a test instrument. It may be convenient, but it places undue stress on the 900 elbow connector. Some test leads have been found to have separated inside the elbow, but can indicate voltage when verifying function. To ensure the test leads are not internally damaged, wriggle the test leads when performing the initial verification. Safely pull the leads while testing on a known voltage source. Any interruption indicates a possible internal break. Test leads can be easily damaged during use (or improper storage), so best safety practice is to replace them annually. They are expendable and low cost. Test the circuit that is supposed to be de-energized and verify the absence of voltage. Once absence of voltage testing is complete, re-verify the meter is still functioning properly by going to the same known voltage source and making another measurement. This is known as "live-dead-live" testing and is mandated by OSHA when voltages are above 600 volts. It is also required by the NFPA 70E in Section 110.4(A)(5), Operation Verification, as well as Section 120.1(5), Verification of an Electrically Safe Work Condition. Test instruments lead a tough life and when your life depends on them, live-dead-live is the only way to go, for voltages of any level.